Within the day, she’d requested that Ashley Madison delete her account. They agreed, and told her it would be “hidden” from the service. It wasn’t until Grace was contacted for this story that she even realized her data was still out there, and had become part of the Ashley Madison data breach and leak. 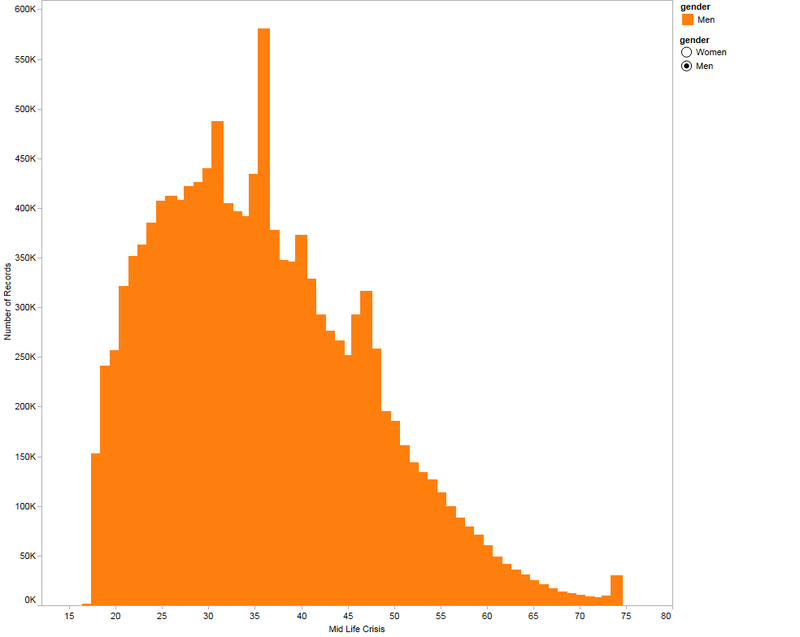 Age distribution at the time of joining Ashley Madison, based on data from the Ashley Madison leaked databases. Men in orange, women in blue. However, what college students lack in married malaise, they more than make up for in curiosity. Joshua Ullom seems to typify this group, saying that he and some friends made an account for “drunken laughs.” They didn’t talk to anyone on the site, and Ullom says that the absurdity of the entire thing was hard to get past. Other stories are similar. Most report being curious or bored, or stunned that such a brazen infidelity site could exist. Several hinted that they might have really tried the site, but refused to take part in the story. Pauley was a student at Kent State university when he signed up, and he signed up hoping to meet women. 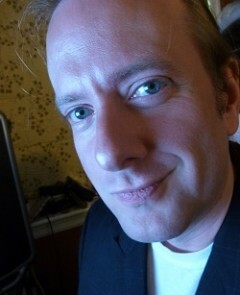 He said that he was intrigued by the site’s “guaranteed” results. Having tried several free dating sites at the time and found that they seemed filled by people who were “catfishing,” Pauley decided that he would try something else, and see if a paid dating site was any better. Distribution curve for women. Very similar to men, including the spike of membership from people who were 36 (or *claimed* they were 36) when they signed up. He said that these profiles all followed a similar pattern: A woman would message him, but refuse to ever send new pictures, or talk on the phone, or meet, or even chat on AOL Instant Messenger, which he said was very popular at the time. Pauley believes that one of the profiles he exchanged messages with was an actual, honest, breathing woman – unlike the others, which he said he believes might have been fake profiles, meant to keep him interested and on the site. This seemingly authentic woman reported that she’d gone on a few dates with men she met through Ashley Madison, but the men were always “too aggressive.” Eventually, she stopped talking to Pauley, and after three months or so, Pauley closed his account and gave up on Ashley Madison. 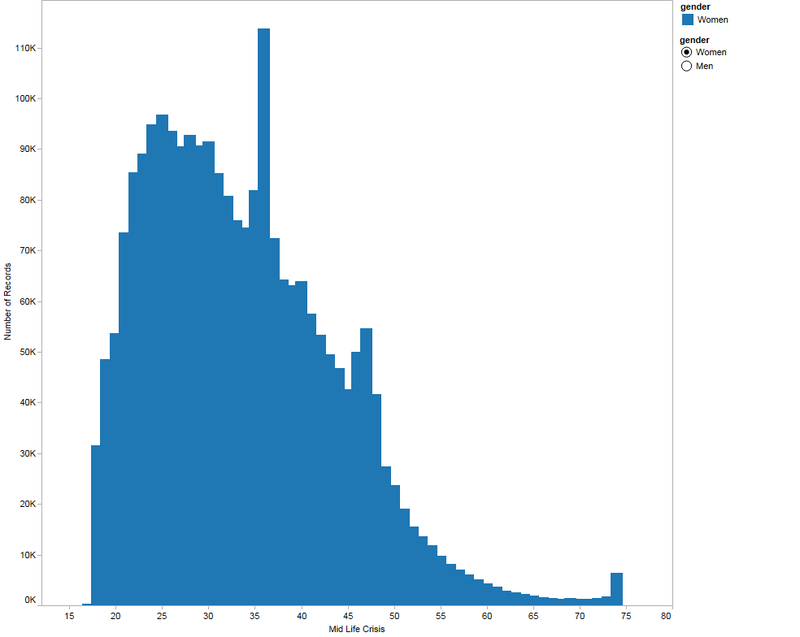 Age distribution for men when they joined Ashley Madison. 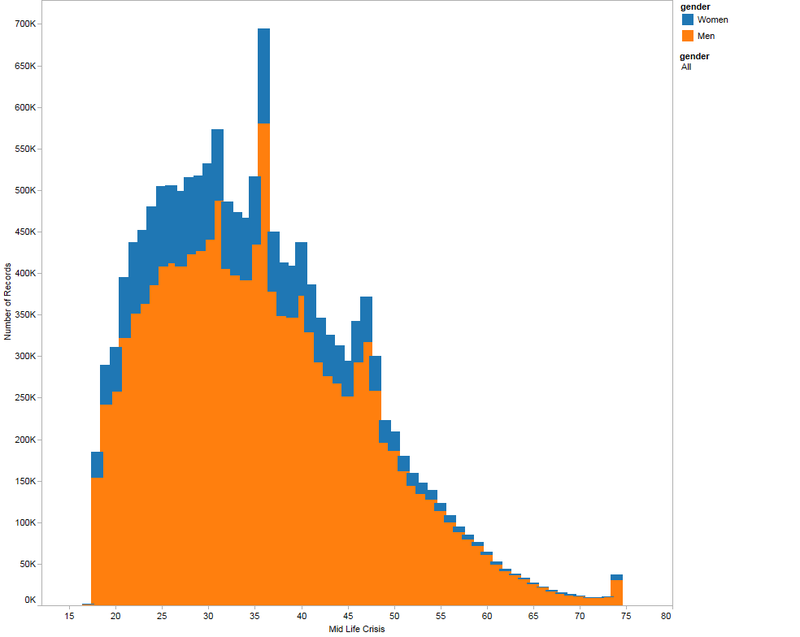 Same jump at age 36, and if you compare the *scale* of the male distribution curve, you’ll see that there’s roughly a five-fold difference in the number of men than women on the site. This may explain some of the “aggresssion” the woman Pauley corresponded with described. “I just canceled it, and didn’t try online dating for several years,” Pauley said. Others said that they never went as far as Pauley, with many saying that they quit as soon as they realized they’d have to pay to properly join. Anthony Buck, a student at the University of Alabama at the time, said he signed up because his friends were hanging out and couldn’t believe that there was actually a site specifically for having an affair. Grace’s single day of membership was more than enough for her. She says she’s offended that her data is still out there, that this prank profile has come back from her past. Click on the map below to get an interactive view of colleges around the country with e-mail addresses in the leak! Map shows total number of matching e-mail addresses for colleges and universities across the country. 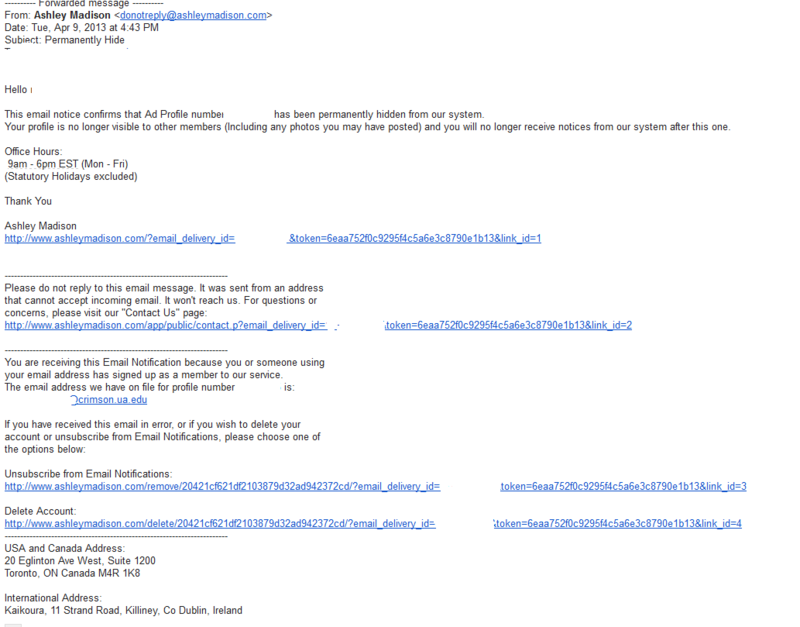 Note that there is no way to know how many of those e-mail addresses were used deliberately by their owners. Soon I’ll wrap this series up – but first, we need to take a look at Swiss-Americans, and their reverence for the Mason-Dixon line. The Swiss aren’t particularly common in America, but they’re notably sparse in the South. Apparently, whatever brought those with Swiss ancestry to the United States didn’t involve a love of sweet tea and kudzu. Today we look past the general term Hispanic to see where America’s Hispanics truly come from. Calling someone “Hispanic” is like calling them “European.” It speaks somewhat to their ancestral heritage, but encompasses a *very* broad swath of very different folks. 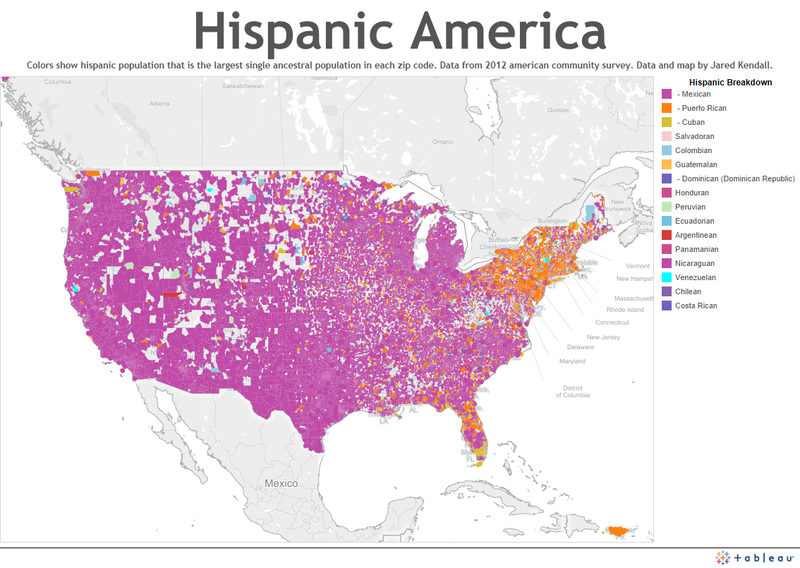 Yet as we see when we map the United States by most populous Hispanic sub-type for each zip code, we find the Hispanic population of America is, overwhelmingly, Mexican. I started this series, in part, because of the fact that immigration and citizenship have been in the news lately. While my maps have focused on every aspect of the American ancestral makeup, the portion of our tapestry which is currently under debate is the one I look at today – Hispanic-Americans. Hispanic is a broad category, and I plan to publish a more detailed map of Hispanic America which will show not only where Hispanics live, but where Hispanics from various nations live. After all, Hispanic is just a category – it encompasses a lot of nationalities, and lumping them together ignores this varied heritage. Keep checking my site – at the moment, I intend to have that new, more detailed map ready tomorrow. Hispanic settlement isn’t particularly surprising, although I do find it odd how quickly numbers drop off when you cross the Louisiana-Texas border. If you want to find Swedes in America, head to Minnesota. While Swedes can be found across the plains states, they are concentrated in the Minnesota region. I expected to see a strong concentration of Russians on the East Coast near New York City, for whatever reason. I was wrong. The region of the United States with the highest percentage of Russian ancestry is actually off in the Dakotas – perhaps testimony to the Russian ability to live through blistering summers and polar winters… Or perhaps not. Either way, I was surprised by the results – and that’s always a good thing. The Portuguese favor two locations in the United States – Massachusetts, and Southern California. Outside of those small enclaves, they’re nearly nonexistent, creating a vast empty expanse when mapped. I would imagine someone with some knowledge of Portuguese history could shed some light on why their descendents are found in those areas – the map, as it stands, is just a tantalizing clue in need of further explanation.